Redemptorist Father Thomas Schmidt, a gifted preacher and beloved parish priest, died of liver cancer Friday, Dec. 14, at a hospice in Huntington, Long Island. More than 50 years a Redemptorist, he was 72 years old. When news of Father Schmidt’s death was announced at the weekend Masses at St. Martin of Tours Church in Bethpage, NY, parishioners wept, mourning the loss of their "grandfather figure," said his younger associate there, Father James Szobonya. 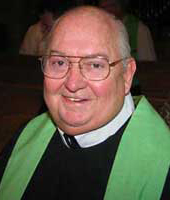 Father Schmidt had served the people of St. Martin’s for the past 11 years. The son of the late Francis and Margaret McMahon Schmidt, Father Schmidt was born on January 25, 1935, in Brooklyn, NY, the second of the couple’s three children. Impressed by the Redemptorists at Our Lady of Perpetual Help Church, he entered St. Mary’s Seminary after completing grammar school. He continued his studies at Mount St. Alphonsus in Esopus, NY, where he earned a Bachelor’s degree in 1959 and a Master’s in Religious Education in 1963. He made his first profession of vows in 1957 and his final profession in 1960. He was ordained to the priesthood June 17, 1962. Father Paul Miller, one of his classmates, recalled their student years: "He was very, very affable and we used to enjoy playing pranks on him because he always reacted very well." Father Miller himself remembers filling his classmate’s room with drone bees – no stingers but an alarming sight – and dropping a few malodorous mementos from the horse stables behind his radiator. "He was a classy guy, but not hoity-toity and you could tease the life out of him," said another classmate, Father John McGowan. "He was well-liked, became a good rector, always the same good guy – a 300 hitter. I don’t think he had an enemy in the world; he was really loved." Father Francis O’Rourke joked, "He was not part of my crowd; he was a studious type, really serious about being a preacher.. I think what happened with that class was that they picked the best four guys for mission preaching and the rest they sent out of the country!" Father Schmidt was among those chosen for the mission band, serving from St. Clement Mission House in Ephrata, PA. In 1973, he began to have greater involvement with the Marriage Encounter Movement and was granted permission to do that full-time for the following year. In 1975, Father Schmidt was appointed rector at Notre Dame Retreat House in Canandaigua, NY. Father Dennis Foley, another classmate and a longtime friend, recalled that Father Schmidt became involved in the healing ministry through the Charismatic Movement at this time. "Tom was a good healer and a wonderful confessor," he said. It was Father Schmidt who introduced his confrere, Father Dennis Kelleher, to the healing ministry and that became Father Kelleher’s full-time ministry for the rest of his life. Father Schmidt was named rector of San Alfonso Retreat House in West End, NJ, in 1981 and, after serving two three-year terms there, was appointed rector of St. Joseph Church, Odenton, MD. In 1993, he was named pastor of Our Lady of Perpetual Help Church in Edgewater, MD. It was during this time in Maryland that he and Father Foley, who was stationed at St. Mary’s Church in Annapolis, would get together regularly for dinner and enjoy their vacations together. "He was a wonderful traveling companion, enjoyable company always," Father Foley said. "He was very unassuming, a real gentleman." It was in 1996 that Father Schmidt was assigned to St. Martin of Tours in Bethpage. Joyce Enderle, parish secretary for many years, said, "He’s been a big part of my personal life and I think everyone here would say the same thing. I remember when my daughter-in-law’s mother was sick with cancer and when she died, he was here for the family. Even after he had open-heart surgery, he baptized my youngest granddaughter." Mrs. Enderle’s daughter heard the news of his death from Father Henry Sattler, celebrant of the parish’s Teen Life Mass, and told her mother, "Everybody just cried." Mrs. Enderle added, "He really touched all age groups." "People here considered him their family priest, " said Father John Tizio. When he, Father Sattler and Father James Szobonya were assigned there during the present triennium, "Father Tom was the only one from the old regime," the one who knew who was who, where everything was, and how the parish had celebrated special feasts in the past, Father Tizio said. He noted that it was Father Schmidt who, until this year, organized the youngsters and prepared them to present the Christmas Pageant. He also led a Scripture Study group, supervised the altar servers, and made newcomers feel at home when they came to the RCIA program. "He was welcoming to anyone, whether a fellow Redemptorist or any of the parishioners. We were very honored to have him live with us. He had a nice, gentle smile and a twinkle in his eye," Father Tizio added. Father Szobonya said he was impressed with his older confrere’s fidelity to prayer and his dedication to the sacraments. "He celebrated Mass with great solemnity," he said. "Just recently, he had a 50-year wedding vows renewal, a First Communion and a Baptism. He also did a lot of funerals." Father Schmidt always wanted to do his share of the work and he worked right to the end of his life. "The rectory feels kind of empty without him now," Father Szobonya said. Feeling Father Schmidt’s loss most keenly is his younger sister, Maryanne Barbero. (An older sister, Florence Donalds, died in 1976.) Mrs. Barbero recalled that when she and her husband Robert were engaged, they waited for her brother’s ordination and First Mass, so he could preside at their nuptials the following week. "Bob became like a brother to him and the three of us became really, really close," she said. Father Schmidt was widely known for his great delight in Christmas and, for the past few years, Mr. Barbero has served as his Santa Claus at parish Christmas parties. "My brother was holy, loving, understanding, and never judgmental – even when I thought he should say something to the kids," Mrs. Barbero said. To her children, Father Schmidt was "Uncs"; he gave them each a nickname – "Pints" for a petite niece, "Dr. Bob" for a serious and caring nephew, and "Fuzzy" for the baby of the family whose first head of hair could not be tamed with a brush. Mrs. Barbero told of a special story she and her brother enjoyed recalling of how a door-to-door salesman left an image of Our Lady of Perpetual Help with their grandmother, promising to come back in a week if she decided against keeping it. He never returned. "Our grandmother liked the picture, but she wasn’t Catholic and didn’t know about it. Somebody told her about Our Lady of Perpetual Help Church, so she went there to find out more," Mrs. Barbero said. "Because of that, she became a Catholic and raised our mother as a Catholic and Tom became a priest!"